This is my review of the Sala Lounge Cap Des Falco at Ibiza Airport. It followed my review trip to the Gran Hotel Montesol in Ibiza (Hilton’s Curio Collection) which you can read here. My next stop was to be Madrid. Unfortunately the F*** Me I’m Famous Lounge (officially the “airport lounge club in conjunction with DJs Cathy and David Guetta, which includes a cocktail bar, dance floor and chill out area“) was also shut. I made my way to the only other lounge at Ibiza airport – only to be turned away. After checking the website where I was reassured that a Business Class tickets WAS going to get me in, I went back to ask why she turned me away. Her explanation was that she thought I didn’t have a Gold Card and she didn’t know I was flying Business Class – telling her AND showing her my boarding pass had not convinced her? 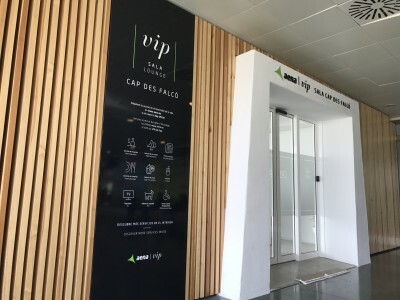 If you don’t have the right credentials, the airport website says that you can buy a lounge pass via the Aena app for €20.10 or pay €28.70 at the counter. Not that I would have paid this, but it would have been nice to at least be informed about this option. You cannot get in with a Priority Pass or Lounge Club card either. (EDIT: the lounge joined Priority Pass in February 2017). First of all the lounge was empty. There were two people in the lounge and only two more came a bit later during my visit. To be fair the design is quite nice and simple (and screams for red wine stains – probably the reason why there was no red wine to be found in the lounge). Considering the size of the airport there were enough seats, however I assume that the lounge will get pretty busy once the summer party season starts. and a couple of sandwiches and salads in the fridge. The salad was ok-ish. The coffee was good. 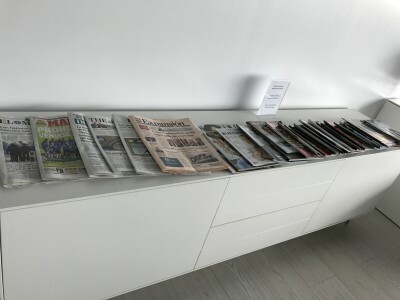 This was the magazine and newspaper selection with Spanish and English titles. What can I say? Last time I was at Ibiza airport in winter I had three hours to kill and no lounge access. As there was only one cafe airside open, it was a painful experience. At least this time I didn’t have to pay for water and coffee. Having an ‘Iberia Gold Card Only’ policy sounds almost understandable when the airport gets busy during summer. 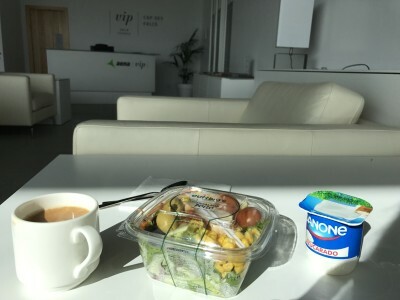 The failure to accept any sort of British Airways card, even when flying on BA, is more likely down to BA’s refusal to pay – or I just wasn’t lucky with the person working in the lounge that day. From the outside you get the impression of a classy lounge with decent drinks and food (hey, it’s a ‘VIP lounge’ after all). Once you get inside the only decent things are the armchairs. Don’t get me wrong – any lounge is probably better than no lounge at all. However if you don’t get lounge access with your boarding pass or status, I wouldn’t recommend paying for it. Well, quite a lot more actually. A little info on any of the above would have been a starter. This review bears no relation to my multiple experiences of the lounge. 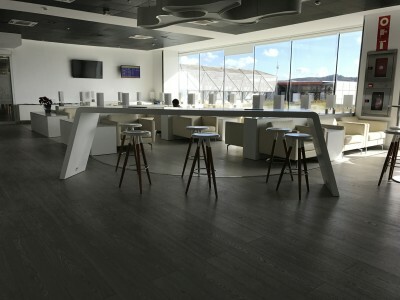 The lounge staff are normally super-savvy about who can get in (I have seen a pribnted grid of cards for who can get in) – not least because they spend their entire day turning away British Airways customers as BA won’t pay for the lounge. The lounge accepts Dragonpass but not Priority Pass or any other lounge card scheme. 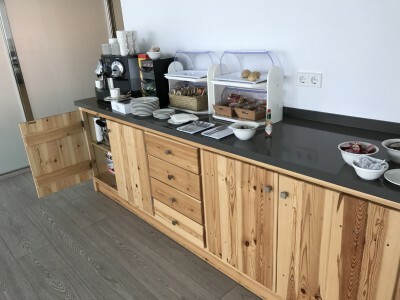 When I was last there on 14 Jan the very nice lounge agent said the people from Pririty Pass were coming “with the machine” soon and they were signing the contract in a few days. So fingers crossed it gets sorted soon. My experience is that this lounge is a really welcome well-stocked oasis away from the Burger-King hordes at Ibiza airport. You sound like you’re copying and pasting from a brochure. And you appear to have an attitude with your response. The photos there are representative of what you would expect in season. If your reviews are going to be opened by totally inaccuracies to crack a joke and make an opening and then continuing in the same tone, maybe you would be better off not reviewing things at all ? The issue with not accepting BA cards is to do with BA not being willing to pay on a Gold and CE heavy route – which is the real story here – which somehow you have missed. D) It does NOT accept ‘appropriate’ customers from Iberia because if it did then a BA Silver or Gold card would get you in, which it doesn’t. It accepts ticketed business class Iberia passengers only and then only if reception is in the right frame of mind as we saw. E) Had the lounge actually let Anika in, instead of making her wait half an hour during which she had to get hold of me in London to dig out the access guidelines after being refused entry with a J ticket, she would actually have had more time there to see what was available and she may even have been better disposed towards it. F) Most HfP readers would need to pay to get in here if it doesn’t take Priority Pass or BA status cards. The question is not ‘is it better than sitting in the terminal?’, the question is ‘should you pay €28?’. We applied higher standards here. Good news if it is coming to Priority Pass. If you want to bring up attitude mate I’d take a look at yourself first. Anika is entitled to her opinion and she can only review what she sees. She wasn’t there in the summer and her photos of the fridge in winter are just as valid any taken by you in summer. I have no idea who you are and as such I think I’ll stick with Anika and Rob’s reviews rather than yours. How then did she not see that the F— me I’m Famous lounge no longer existed (it rebranded two years ago), lifted a quote about it and used that to setup her article around her bad experience ? FWIW I really value Anika’s articles as they are very detailed and feel very personal. It is a shame she had such a poor experience this time. Why does your counter-review sound like a commercial? “The chairs are very beautiful” ?! I added the quote during editing, because I didn’t think that the over-30’s on here would know what she meant (I didn’t). Note that there are plenty of other websites which don’t know that lounge has closed, because I wouldn’t have been able to get the quote otherwise. Clearly Davis spend too much time their life in this shabby lounge. Anika is entitled to her opinion. As most flyers cant access this lounge based on BA status, the overall conclusion is that it is not worth paying to access it. Which I agree with. Spend more time at the beach/pool than get to the airport in time to board rather than look forward to the lounge. B) If Davis comments about the FMIF lounge closing two seasons ago are accurate, it seems reasonable for us to consider that no particular high standards of verification have been applied. Coupled with the recent advice of the IHG Points break likely starting at 2pm UK time, when all other blogs suggesting the equivalent of 5PM, maybe some sloppy standards are creeping in? But other than that – keep up the good work! There is no official PB start time. They go live in the morning, US EST, which means 2pm onwards. They were historically 2pm-ish – I admit that if the last couple had been nearer 5pm it may not have registered with me as I am so used to 2pm. However, if I’d said 5pm and they had gone back to 2pm then the best options would have gone before you checked. As a Spanish speaker of Spanish descent, I can say that Anika’s experience sounds absolutely typical of the bureaucracy one can expect when trying to carry out the simplest of tasks in Spain! 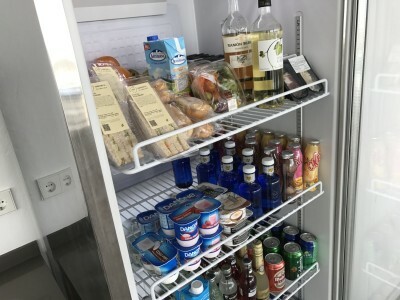 I was trying to find a photo of the booze selection – my point here is that whilst I don’t usually go to lounges returning to the UK as I have to drive home (= no drinking alcohol other than maybe a beer!) – for those going home in the UK with somebody else driving, you can very easily justify EUR20-28 to get in. That’s cheaper than a couple of alcoholic drinks & a sandwich on the other side plus it does look very calm & relaxing! Source of ire in comments mystifying. The good news perhaps that complaints about a German with a sense of humour help bury the stereotype. Perhaps Davis would like to write the review,as he has such a lot to say. Surprised he didn’t jump on the chance to do this when Rob was looking for folk to write lounge reviews. Granted there may be aspects missing,but usually the helpful and obliging commentators on HFP will add them in graciously. My interpretation of your tone, Davis, was majorly critical and I didn’t like it. 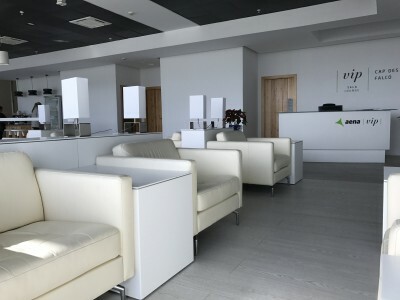 You need to remember that as most HFP readers will have to pay to enter this lounge (no BA status cards, no Priority Pass) the question is whether it is worth €28. Looking at the food and drink selection in those photos I can imagine better ways to spend close to £100 for a family of four. If that’s how you feel about your kids’ enjoyment of the last day of their family holiday, why not leave them at home and save even more?! you got that in the wrong order! I dump them outside @ LHR on the way there, I’m not driving at destination as we get picked up – so I can get my money’s worth/ value from the lounge pass – I do normally bring one of my sons in for safe-keeping but the other 2 get to slum it haha! I might even get him into the lounge on the way out on the strength of it! 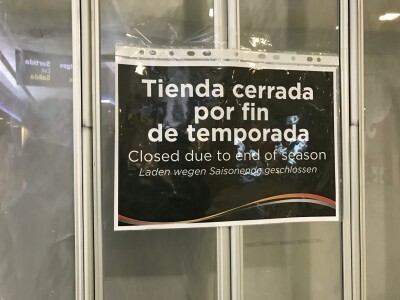 As a frequent traveller to Ibiza out of season I thought this post was useful. However it’s the comments that have amused me the most and I feel compelled to add my two cents…. – Although not a fluent Spanish speaker and am not from Spanish decent I’ve spent enough time trying to get things done in Spain to know that Anika’s experience is indeed typical of the rigmarole one often encounters in Spain. In fact, that part of the review made me chuckle. – Although entertaining, David’s response seems a little fishy to me. Why on earth would someone be compelled to defend a faceless corporation so aggressively. I mean if you really want to right the wrongs of inaccurate journalism just take your pick of the national press in any country- and scarily those titles have real influence. And don’t get me started on social media….. Finally, Ibiza is increasingly a year round destination and does not solely attract holiday makers. The Island can be at it’s most beautiful at this time of year with tons of diverse culture happening! So the report is appropriate to an audience who are a little more savvy, which I assume anyone following head for points would consider themselves to be? For full the pedants among you, and there seem to be a few, I have a property on the island so perhaps my out of season comments are biased, but in fact it’s very easy to verify for yourself by looking at the press or even better raw evidence such as airlines increasing their year round services from multiple countries. The airport is so small and turnaround times are so quick out of season that I probably wouldn’t bother with the lounge even if I qualified. Finally, I had also thought the F**** Me I’m Famous Lounge was still there and as I mentioned I;m a frequent traveller to the island! But as I also mentioned there’s no need at all to hang around in this airport to consider the banal nuances of who has secured the lease to which spaces because it’s very small and very quick to manoeuvre through, even in August!